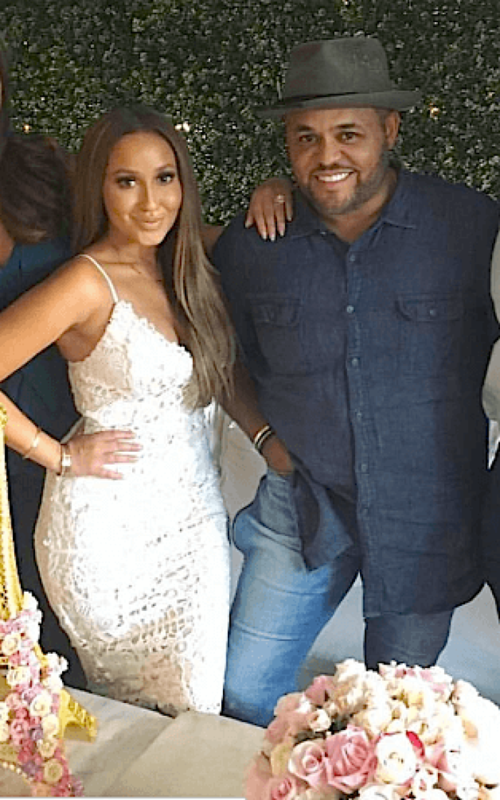 Newly engaged worship leader Israel Houghton says he doesn't deserve to be loved by God or his fiancee Adrienne Bailon but says he embraces their love anyways. In a recent Instagram post, Houghton posted a photo of himself and Bailon at their Parisian-themed co-ed wedding shower hosted by West Hollywood eatery Fig & Olive. "God Favors Me! been listening to this song on repeat for the last several days by @bishophez - I know I don't deserve to be chosen and loved by God let alone by this life changing woman @adriennebailon - but it's not about deserving or earning or achieving one's love- it's about receiving it. And I humbly and gladly receive... my heart is so overwhelmed by both the love of God and the love of this amazing woman. My fiancé, my forever... and like Hez says 'don't worry about your haters, your haters can't do nothing with you,' I receive that too. #HappilyEverHoughton," he wrote. The "Friend of God" singer maintains that he sees God favor in his life during this new season. According to People, Bailon and Houghton greatly enjoyed their shower and revealed that they are saving themselves for marriage. At the top of the year, Houghton publicly announced that his marriage of some 20 years was legally over and despite the naysayers, the singer is giving marriage another shot with "The Real" co-host Bailon. In August he shared an Instagram picture of Bailon's hand in front of the prestigious Eiffel Tower in Paris, sporting a massive engagement ring. "I have seen and felt the essence of God's grace through the life, the kindness and the courage of this woman. I've seen her attacked, lied about, wrongfully accused, mocked, laughed at, and misunderstood. But, I've also seen the shining example of the eagle she is that rises above the cacophony of the noise of ignorants- I'm learning from her example. She loves Jesus. She loves her family. She loves people. Even the ones that don't love her back. I pray God give me that same grace in my life. I've taken a giant leap of faith in asking her to share life with me forever and to give me a shot at getting it right this time... She has graciously granted my request... She said yes. Thanks Be To God. Thank you @adriennebailon for graciously loving me," Houghton captioned the photo. News of Houghton, 44, and 32-year-old Bailon's romance first surfaced when she was photographed in a bikini on a beach in Mexico with the Lakewood Church worship leader (currently on indefinite leave) in March. What started as rumors stemming from tabloid photos that Bailon and Houghton were dating were quickly confirmed. Bailon initially stayed mum as the photos circulated and Houghton was the first to address the rumors. The new romance sparked controversy because Houghton publicly repented and addressed his divorce in an open letter posted on Facebook not long before dating Bailon. "It is with a collective heavy heart that we announce that after over 20 years of marriage and a long separation, Meleasa and I are officially divorced," he wrote. Bailon was pegged as the reason for Houghton's divorce when the beach photos surfaced, but the actress maintained that she didn't even know him at the time of his personal failure, and said that the public blaming her for a marriage ending was "hurtful." Houghton has since taken leave of his role as worship leader of Pastor Joel Osteen's Lakewood Church but is still out doing concerts.